We are thrilled to have the Hickory Brass join Abington Choral Club to herald the holidays on Saturday, December 1st at 7:30 PM. 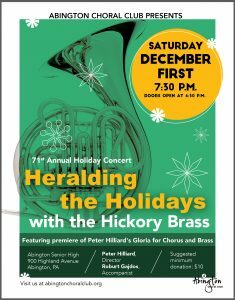 This concert will delight and entertain with a mixture of “brassy” surprises and holiday classics. For this special occasion, our Director, Peter Hilliard has written a Gloria for chorus and brass. Other highlights of the concert include the Pinkham Christmas Cantata, a short, exciting work for double brass, chorus and organ along with several great pieces written for the Canadian Brass Christmas album. We have some terrific Hanukkah selections and a special arrangement of Silent Night (also by Peter) in honor of the song’s 200th birthday. These, along with some traditional sing along music, will make for a fun and festive time for the whole family!